I've always been an animal person, especially when I was young. I used to get so worked up when I'd see a dog running loose, afraid he'd get hit by a car or not be loved (lonesome). It was a big deal to my youthful heart. We always had dogs when I was growing up (one I brought home from the fair, hahahaha, but that's a story with a funny twist for another day ;) ). They always lived to be 15 or older, so they were family, AND they made me think I was just a 'dog person.' Enter today where we've had a cat enter our lives and steal our hearts. When we first met him he was old and broken, a victim of a raccoon attack we think, he is now (still) old and completely healthy (save for the one eye he has that could not be saved), content and a real sweetheart. We have also been cat sitting my granddaughter's cat who has introduced to a whole new side of the feline attitude. This cat is young, spunky (he chases his shadow every evening and it makes us laugh), and s.m.a.r.t. (sometimes too smart for his own good, such as yesterday when he got in the cupboard under the sink and I moved a cooler in front of it to mop, ha! 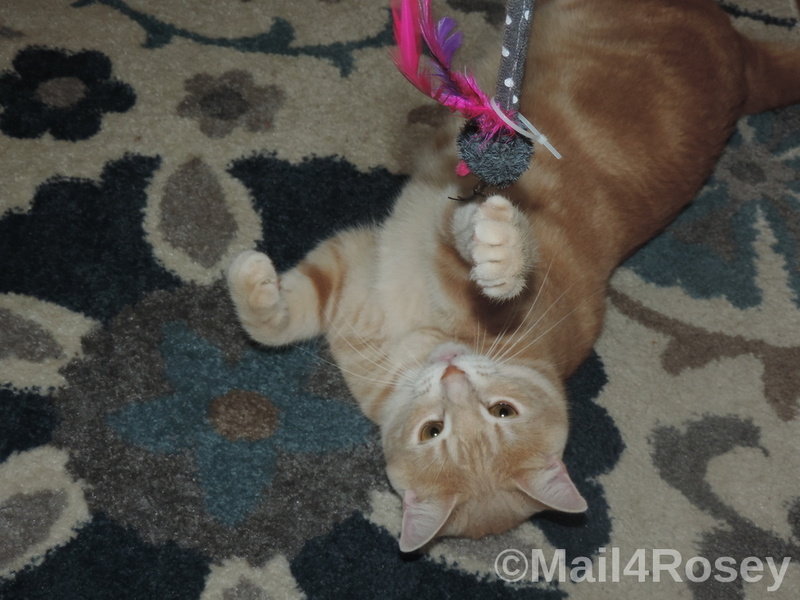 Goofy cat!! Thankfully he 'knocked' on the door and I let him out). Right now he's sound asleep on a pile of clothes I was bagging up to give away. I had to stop midstream because he kept getting in the bag and messing with my clothes (he's a little stinker too, did I mention that?). It's going to be so hard to give him back!! We only have this week left with him, and then my grandbaby girl will come to collect him. I bet she's missed him too. :) Anyway, my experience with these two cats has absolutely made me not only a 'dog person' but now also a 'cat person,' and the same for my son too, who is completely smitten with the kitten (as well as the cat). I am also now a cat advocate of sorts too. If I can help get the word out to make any cats' lives easier and better, I am very happy to do so. Did you know that of the 3 million cats and dogs euthanized in shelters each year, approximately 2.4 million (80%) are healthy and treatable and could have been adopted into new homes? I find those statistics abhorrent and heartbreaking. Well, Freshpet is on a mission to help save cats, and I want to help spread the message. In honor of their new expanded fresh cat food line, available in 50 Select Walmart stores, Freshpet is offering free pet food and more to adoptees in select shelters and rescues. Awesome, right? And very socially responsible and kind. Freshpet®, Inc., the first and only maker of fresh, all natural, real food for pets, debuts exciting new freshly prepared meals for cats. For the first time, Walmart stores in select towns will offer an expanded line of cat meals, all found in the “purrfectly” sized refrigerator located in the dry cat food aisle! 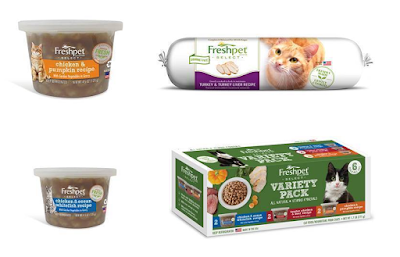 In honor of this expansion, Freshpet® has partnered with local shelters to create a cat rescue engagement program in Arkansas, Connecticut, Florida, Rhode Island, Washington and Wisconsin. This brand is not like any other cat food. Unlike traditional dry cat food, every Freshpet® recipe starts with moisture rich, high quality poultry, meat or fish which helps provide cats the natural hydration they need. Cats tend to have a natural low-level thirst drive and Freshpet® products were made to retain high levels of moisture and provide natural hydration. All the healthy, protein-rich Freshpet® cat meals are grain free and made in the USA using only the highest quality natural ingredients. Freshpet® believes all pets deserve to benefit from eating fresher, less processed foods just like we do to stay healthy. And they’ve heard from thousands of pet parents who have seen their pets become happier and healthier due to a fresh diet. ROASTED MEALS – Tender, bite-sized morsels made with fresh chicken, fish and veggies. CUPS – Indulgent, bite-size morsels made with real meat, fish and veggies in a mouth-watering gravy. ROLLS – Gourmet, soft & smooth pate-style meals made with high quality chicken, beef or turkey. I think this is a great initiative, and I hope you will help spread the word. 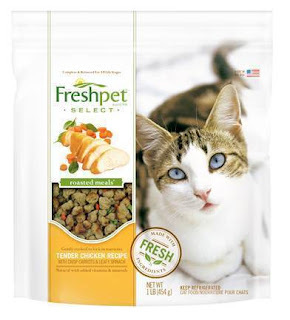 Freshpet meals for cats are available in select Walmart stores in West Palm Beach and also in select Walmart stores in Florida, Connecticut, Arkansas, Idaho, Massachusetts, Maine, Minnesota, North Dakota, New Hampshire, Rhode Island and Wisconsin. That is great for them to do indeed. Those statistics are awful for sure. Each cat sure is different. Being a both cat and dog person is a fine way to be too. I love all four legged critters. I'm a dog and cat person. A pot bellied pig person. Having great food for them is essential. We always have thought of our pets before ourselves. This makes me wish I could have a cat. I love furry 4 legged creatures. My stupid allergies just don't dig them. What a great initiative. It hurts my heart and my head to learn how many healthy animals are killed. I grew up with dogs and cats (among other things) and love them both. Good policy for them. No pets in my life right now. No pets either but that's great they help shelter cats. I'm sure my cat Roxie would love this! Unfortunately she has to eat a prescription food. I like that they help shelter cats! Great cause! Awhile back I had a momma cat and her liter in my backyard. I ended putting them a shelter to find a good home. I have two cats and I'm pretty sure they are bored of eating the same food. I'll definitely buy the chicken and beef combination. I so love that Freshpet is doing this! So wonderful. I have two cats and am a huge cat person. I wish I could save them all! I am a pet parent to two cats and three dogs. I love any pet company that also seeks to help out animals in shelters who are in need! Although I don't have a cat, I am a real animal lover. It's so awesome to learn that Freshpet has partnered up with local shelters to help the animals. I love news like this - it makes my day! My kitty definitely would not mind using Freshpet, if they are on the budget. Your cats reminds me of my friends cat.. So so adorable. I really don't do pets. This is such an amazing thing for them to be doing. The brand is also so great for cats. Both my cats are from a rescue home and I really wish they'd have a brand partner with them to give them a hand. They do such important work. What a great way to feed homeless cats. I think more company should do something like this. It would keep animals from starting in hopefully be able to make it to a good home. That is a great initiative! We just adopted two rescue cats, so this is a cause that is near and dear to us. FreshPet makes such great products, it makes it easy to support this cause. I am delighted to see a noble cause.Its really good to see so much of love for cats.. I actually just noticed the Freshpet cooler at our store recently! I'm pretty sure all of our dogs and cats would enjoy that. That's pretty cool that they are offering free food to those pets. I think it's commendable for a company to dedicate that much of their operations for no return. It shows the company has a spirit of caring. Thanks for sharing. Currently my cat is with my Mom, and these are perfect! Thanks for the tips. I should shop him for these goodies. It does look like they have some pretty great food for pets. I wonder what kind of preparation has to go into them when you get them ready for your pet. But I do think it's so cool. I love Freshpet. And I'm an animal lover too. Somehow everyone always brings us strays. As a cat owner, information like this makes me happy. I will check them out and see if my cat will enjoy their foods. Thanks for this! I'm def more of a dog person but food is very important when it come to my fur baby! oh wow freshpet is new to me. We've recently started taking care of a cat and i definitely want to give her the best food possible. Will be checking freshpet. Any company that helps out shelters, whether for dogs, cats or anything else, is tops in my book! Good for them! Stinky Boy Sydrome? You Need Hero Clean! Birds Eye Veggie Made™ #Giveaway! Save Money on the Hotel with Groupon! Yeezy Boost 350 Shoes That are in Stock!